Despite recent outbreak of violence, senior political source says government approves fresh infusion of Qatari cash to Gaza. A senior political source said on Thursday that Israel's security cabinet approved a fresh infusion of $15 million from Qatar to reach Gaza. The decision comes following recommendations by the IDF and the Shin Bet that the government approves the cash infusion. Netanyahu had frozen the transfer earlier this week after an IDF officer narrowly avoided death when a sniper shot him in the helmet during clashes on the Gaza border. 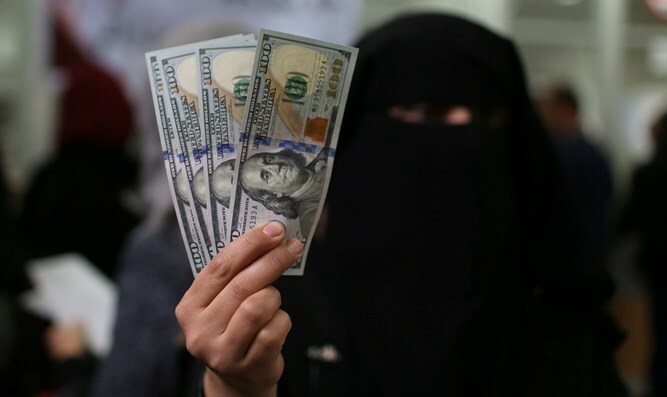 Israel has already allowed two installments of Qatari money to enter Gaza, which is used for the payment of Hamas employees in Gaza. On Wednesday evening, reports said that the defense establishment recommended that the $15 million be given to Hamas in order to calm tensions between the two sides. Senior security officials also said during the cabinet meeting that the Islamic Jihad terrorist organization was responsible for shooting the IDF officer and not Hamas. They also claimed that the Hamas terrorist organization has refrained from creating provocations against Israel in recent days.